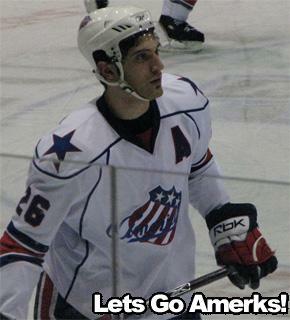 Featured Player: Mark Mancari · Let's Go Amerks! London, ONMark Mancari knows how to use his size to his advantage on the ice. With a slap shot that can take a head clear off and the ability to play both offense and defense, Mancari is an asset to any professional hockey team. He is known for being very coachable with a coach who cares, very smart and versatile. Mancari is always willing to do what it takes to get his team a win. He will play any position asked of him to help the team. He is one (if not the most) hardworking players in the Rochester Americans lineup. Mark spent his entire junior career playing for the Ottawa 67’s where he played 226 games racking up 76 goals and 82 assists for 158 points. He started with the 67’s as a defenseman, turning to offense once his skills were seen. In Mancari’s third season with the 67’s, he nearly tripled his point output of his first two seasons combined. In his last year with Ottawa, Mark was awarded the Brian Kilrea Award for community involvement. He was also named the Booster Club’s Best Two-Way Player and was the runner-up for the Booster Club’s Best Offensive Player. Mancari was drafted in the seventh round (207th overall) of the 2004 NHL Entry Draft by the Buffalo Sabres. Last season, Mark received two more recalls from the Sabres playing in three games for them. He had one assist and two penalty minutes during his stay there. Many people wonder why he hasn’t been recalled yet this season with the Sabres lacking size and heart. Mark has more heart than nearly every other player does in professional hockey. Mancari finished 3rd on the Amerks in points last season with 58 points (23 goals, 35 assists). He was also awarded the 2006-07 Fairand/O’Neil Sportsmanship Award. After this season, Mark becomes a RFA (restricted free agent). Mark Mancari: Three years old on, when my parents first put me on skates. MM: My parents and my brother. MM: I have one older brother. MM: I have two. Finishing my Jr. Career in my hometown of London, Ontario and playing in my first NHL game. MM: It would have to be scoring a hat trick for my grandmother a day after she past away. MM: Clarke MacArthur because we have been here for three years and we lived together out first year. MM: I like to relax, hang out with my girlfriend and my dog, shop, go golfing, and see movies. MM: I train, golf and hang out with family and friends in London [Ontario]. MM: I have always loved Shawshank Redemption.